Late on the release blog post for this one, sorry. 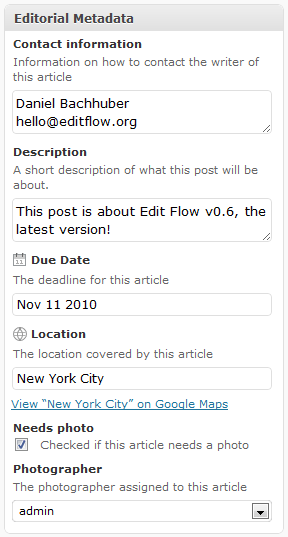 A week or so ago, we finished Edit Flow v0.6.4, which you can now download from the WordPress.org forums. The most significant improvement is that you can properly bulk edit posts and pages with custom statuses. 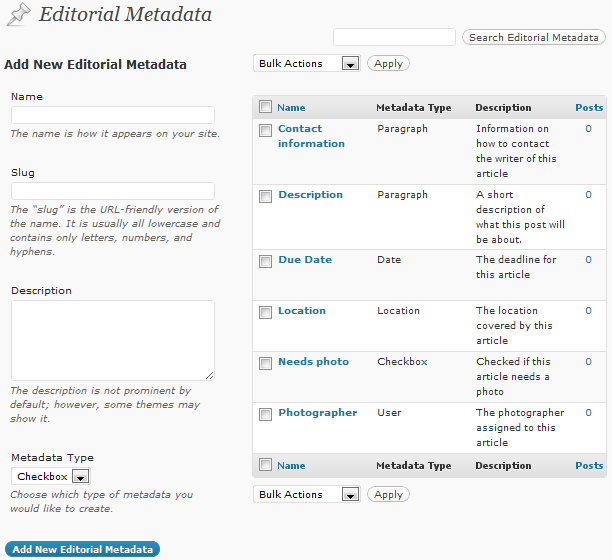 For editorial metadata, we’ve added a “Number” metadata type, along with a link to easily clear the field when dealing with date metadata. Lastly, we’ve added filters for the “Posts I’m Following” widget on the dashboard, and for the posts that appear in the calendar. If you’ve wanted to add custom post types to either of these interfaces, now’s your chance! Check out our full changes in the changelog. Also, we’ll be moving from our Google Group to a development P2 if you’d like to follow along. We released Edit Flow v0.6.3 on Monday to fix/add a few things. First, we restored email notifications to old delivery method instead of queueing with WP cron because of reliability issues. This should fix any and all notification delivery problems. Second, per a request in the forums, we’ve added the ability to see just “unpublished” content on the story budget and editorial calendar. This could be pretty useful for those newsrooms with a lot of content published on a daily basis. We received a question from Quint Randle about how to customize the number of posts displayed in the Story Budget view of Edit Flow (which is 10 by default), so I thought I’d write up a quick tutorial here. It’s simple, and enabled in Edit Flow by this bit of code. 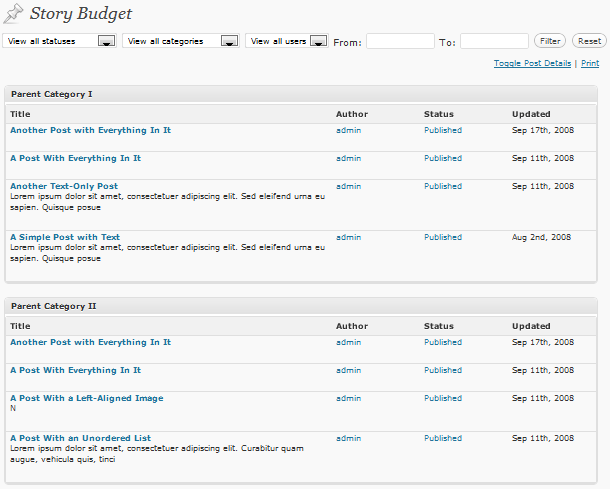 Just modify the ’20’ above to whatever number of posts you’d like to see in the Story Budget view. And voilà! Of course you could split out the create_function call above to actually use a function that you’ve defined elsewhere in your functions.php file, but unless you’re going to have complicated logic to decide how many posts to display, I don’t see the need for anything beyond that one-liner. Any further tutorials you would like to see on our blog here? There are lots and lots of filters baked into Edit Flow that are just dying to be unlocked by you, our users—let us know in the comments below what you’d like to customize or see in action and we’ll do our best to explain how to use it! And as always, for support questions, please post your question here. We’ve received a number of requests from Edit Flow users asking for the ability to limit statuses to specific roles. While this isn’t possible via the WordPress admin, you can write a bit of code to implement this. Just add the following snippet to the functions.php file of your active theme and modify as necessary. The code sample limits authors to only set ‘Draft’ and ‘Pitch’ statuses, whereas editors (and administrators, by omission) have access to all statuses. 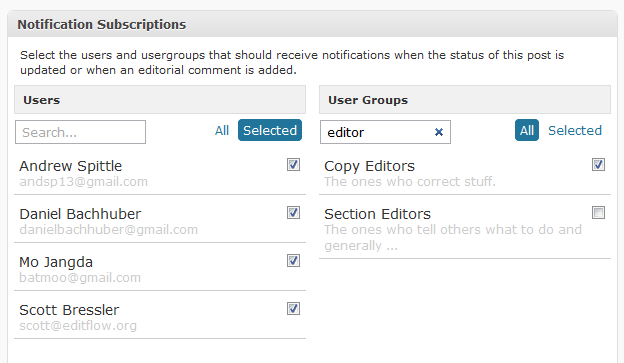 In the WordPress.org forum, a user wanted to know how to disable email notifications for post status changes without also disabling email notifications for new editorial comments. Edit Flow makes this pretty simple to do. Simply add the following snippet to the functions.php file of your active theme and you’re good to go! As of v0.6, Edit Flow hooks into ‘transition_post_status’ to add an email notification when the post status changes. To disable these email notifications, all you need to do is remove the hook. As we start putting the finishing touches on v0.6, we’ve realized that we want to hear more from our users. Please fill out the survey at the below link so we can better shape Edit Flow’s future toward your needs. Thanks in advance!